As with many Lectionary readings, this one is a part of a much larger passage, in fact the entire section this is a part of runs through Exodus 34, and is the story of the loss and renewal of the covenant. The section of that which is today’s reading is divided into three parts. Missing unfortunately from our reading today is Aaron’s all time classic defense of stupidity and idolatry, which occurs just a little further on. That is, when Moses returned from the mountain and saw the mess below, he asks him, “what did this people do to you that you have brought so great a sin upon them?” And Aaron responds by saying it wasn’t his fault (of course), but his excuse is one of the best ever. He says all he did was to ask them for their gold, “so they gave it to me and I threw it into the fire, and out came this calf!” (33:24). Yes, of course, he had nothing to do with it. 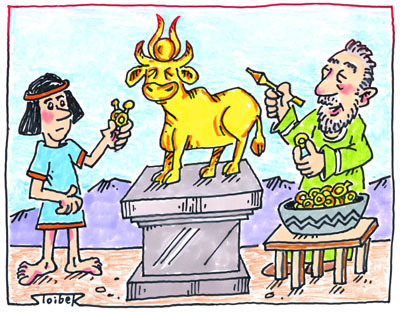 You might notice the little tidbit that the golden calf was made out of golden earrings from the women and children of the male leaders, but not from their own stash. Perhaps it was a connection with Genesis 35:4, where earrings were associated with foreign gods: “so they gave to Jacob all the foreign gods that they had, and the rings that were in their ears; and Jacob hid them under the oak that was near Shechem.” On the other hand, maybe they were just sexist and greedy. Who knows? send hot burning wrath upon them—ingrates though they are. Notice that his appeals are not for the worthiness of the people (that would be a stretch) because both agree they are scum. But instead, Moses first, appeals to Yahweh’s vanity: “Why should the Egyptians say, ‘It was with evil intent that [Yahweh] brought them out to kill them in the mountains, and to consume them from the face of the earth’? And then second, he makes the argument that, with all that has gone on so far with Abraham, Isaac, and Israel, etc., to bury the crowd now would ruin everything. Gene Tucker lists three themes for theological and homiletical reflection that can be found in this passage. If you move fast over them, you could probably construct a three-point sermon using all of them. On the other hand, at least two of them (one and three) could be developed more deeply into individual sermons. (1) The sin of the people, always a popular topic for preachers. More than simply a violation of the first and second commandments, it was also a lack of trust, both in Moses’ leadership (v. 1) and in God (v. 4). (3) God’s capacity to repent. It is the ground of the prayer of confession, and the key factor that makes renewal of the covenant possible. (4) Idolatry, possibly implied in the first one, but could also stand alone. (5) Covenant, or their lack of understanding of it. Here are a few possible titles on the Exodus text. Some I made up, some I borrowed from other, far more creative, people. “Gold Rush,” “Who Done it?” “The Gold Standard,” “Idolatry 101” (implying they need a refresher on monotheism), “Let’s Take it One More Time, From the Top” (implying they need a refresher on the meaning of covenant), “Moses and the Calf of Many Earrings,” and finally, “And Out Came That Calf” (if you spend time on Aaron and his painfully bad excuse for caving to their desires for a second god to worship). 14And the LORD changed his mind about the disaster that he planned to bring on his people. “Delayed”: Everett Fox (The Five Books of Moses New York: Schocken 1993) offers “shamefully late.” He says that the Hebrew word, boshesh, carries with it the connotation of causing shame/embarrassment. nrsv note: Or fashioned it with a graving tool; Meaning of Heb uncertain. “These are your gods ...”: In 1 Kings 12:28-30, Jeroboam I uses the same words to lead the northern kingdom into separation from God, an act that to the northern Deuteronomic historian nullifies the divine promise given earlier to Jeroboam’s dynasty: see 1 Kings 11:31-39. [NJBC] (Northerners are to worship at Bethel and Dan.) Why “gods” and not “God”? (See also v. 8.) Most modern Jewish translations have god in the singular. Two Christian translations, the Jerusalem Bible and the Contemporary English Bible, also have god (and God) in the singular. The Septuagint and Vulgate translations have gods. “Why ‘gods’, when there is only one image? Because to speak of ‘gods’ in the plural is typical of pagans (see 1 Sam 4:7–8; 1 Kings 20:23); the sentence is probably taken from 1 Kings 12:28” (John Barton and John Muddiman, eds., Oxford Bible Commentary (New York: Oxford University Press, 2001)]. “Well-being”: The Hebrew is shalom, a word which includes in its meaning peace (with God and one another). “Revel”: There may be a sexual connotation, as in Genesis 26:8 (when Isaac fondles Rebekah); 39:14, 17 (Potiphar’s wife falsely accuses Joseph of sleeping with her). This might support the idea of a calf being used as a divine symbol. “Remember”: The particular form of the Hebrew verb means remember to one’s credit. “I will multiply your descendants like the stars of heaven”: Recalling the promise to Abraham and Isaac in Genesis 15:5; 22:17; 26:4. “The Lord changed his mind”: God is free to change an announced plan, as has already been done in saving Noah and others from the Flood (see Genesis 6:5-6) and will do in sparing Israel from a plague of locusts (see Amos 7:1-6). “The work of God”: Or God’s making, unlike the making of the calf. Gene M. Tucker, in Fred B. Craddock, Ed., Preaching Through the Christian Year: Year B (1993), p. 470.